As superb an album as 2008's obZen was (and it remains a damn, damn good album as pre-review listens confirmed) it remains something of an experiment in the Meshuggah ouvre, a continuation of the expansionary mindset that saw such triumphs as I and Catch Thirtythree, being extended to draw in everything from Tool to pure thrash. Koloss, then, is a return to (relatively) simple groove, a reclamation of intent and a kind of follow-up to Nothing that expands on that legendary album's palette as well as striking out for new, more atmospheric grounds. What's more, it's a triumph, an album built from its songs to create a near-perfect whole, becoming more and more effective with each listen. 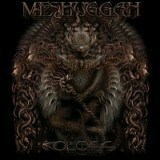 Catchy and immediate from the first listen, becoming subsequently compelling and hypnotic, Koloss sums up the perfect storm that is Meshuggah. The opening, deliberately stumbling groove of I Am Colossus quickly gives way to the rabid speed of The Demon's Name Is Surveillance, a deceptively straightforward charge that follows in the same steps as the previous album's Bleed, if being less maniacally violent. It's a more organic assault, as is Koloss as a whole, less concerned with destroying your eardrums as carefully laying out a technical pattern that leads to their eventual destruction. Take Do Not Look Down as an example, precise drum-backed groove that results in a post-Rational Gaze feel, if being slightly more obtuse and distant in feel. It circles the listener menacingly, never quite moving in the for the kill but keeping its weapons sharp and directed at you. Like all the tracks here, it constantly threatens violence; more than living up to the paranoid intent in the track's name as it balances atop that imagined chasm. It's also catchy as hell, keeping head nodding even as you're constantly aware that looking down is not a good idea! But this is the great contradiction inherent in Meshuggah's music, that it at once embraces and repels, catches your ear with a hook but sends you away by sticking resolutely to the formula that doesn't allow for such typical metal solutions as clean vocals and guitar solos. For although the latter do appear here, they're hardly typical for metal, preferring instead the mind-bending likes of Marrow's avant-jazz bleeping, hearkening back to Destroy Erase Improve's legendary standard. Solos in the Meshuggah style are not mere demonstrations of technical skill (the entire album is that in existence alone!) but peeks into other dimensions in the same way that bands like Cynic and Mithras manage with their individual uses of melody - and it's damn effective. The atmospheric wails of guitar that backs the angular riffs of Break Those Bones Whose Sinews Gave It Motion are a hauntingly melancholic reminder that Meshuggah can have an emotional tug to their music at times, and that seems at full drive here like never before. Of course, few listen to this band to have their heartstrings tugged, and the pulverising likes of Behind The Sun and The Hurt That Finds You First focus on more aggressive aspects of the Meshuggah sound. Ultimately all stays with you, the entire colossal package of diverging reactions to a band all too often dismissed as simplistic and mechanical - as fun as the cranky, irritable cloud of robot insect riffs in Swarm is, even machines sometimes have soul. Listen to the closing one-two of Demiurge and The Last Vigil, icy bionics thawing gradually in the former as a human tone similar to that of industrial metal emerges, desperate and buried, near-extinction yet still clinging to life. The latter, meanwhile, is near-ambient, a slow and hypnotic outro that ejects you from Koloss' strange world back into reality. Meshuggah seem to be taking more notice of the listener with obZen and Koloss, shaping their industrial warfare towards our ears rather than coldly ignoring our presence, and the results are as pleasing as ever.